Performances begin on February 16 & 17 and continue throughout the run of the show. This exhibition springs from The House of Dust, a seminal yet under-recognized late 1960s work by Fluxus artist Alison Knowles. Originally called The Play House, this intermedia piece serves as an entry point into contemporary investigation of the relationships between architecture, technology, and performance. In a text titled Shelter or Playground, R.M. Schindler described his house as a “playground” that “grows with its inhabitants” and where “life will regain its fluidity.” Today, the house opens its doors to contemporary artists who have been invite produce site-specific works, responding to both architectures by Schindler and Knowles and translating them into multiple performative forms. The presentation commissions new work and performances by Henry Andersen & Bryana Fritz/Slow Reading Club (Australia, USA), Lila Athanasiadou (Netherlands), Jasmin Blasco (France/USA), Dimitri Chamblas (France), François Dallegret and François Perrin (France), Milka Djordjevich (USA), Daniel Frota (Brazil), Mark Geffriaud (France), Gerard & Kelly (USA), FLAX Artist-in-Residence Aurélie Godard (France), Jeff Guess (France), Simon Leung (USA) and Luke Stoneham (UK), and Lucky Dragons (USA). It will be accompanied by a program of historical performances including works by Merce Cunningham and Trisha Brown and interpretations of scores by Fluxus artists or those associated with Fluxus—Alison Knowles,Yoko Ono, Alvin Lucier, Pauline Oliveros—by CalArts students on the Nomad Floor. The floor will play the role of a contemporaryHouse of Dustas a studio, gathering place, gallery, blank slate, habitat and point of discussion about context, performing and witnessing performance, open to anyone upon registration to the MAK Center. In 1967, Alison Knowles’s The House of Dust started as one of the first computer-generated poems. Each quatrain began with “A House of . . . ” followed by random sequences of materials, sites or locations, light sources, and categories of inhabitants. In 1969, Knowles translated one of the quatrains into an architectural structure with organic, “non-Euclidean” shapes that, at the time, were in contrast with the technological origin of the poem. The house was first installed in Chelsea, New York, and then moved to CalArts, where a burgeoning community of artists and students created a number of artistic works in response to the structure (installations, performances, dance, concerts, poetry classes, etc.). The physical House thus became an open structure, a platform used to generate and shelter experimental activities. Lost in the 1980s, the only remaining aspect of the work is the poem, which is now reconstituted and open to new interpretations. At the core of this exhibition is the desire to reactivate the generative potential of Knowles’s work and catalyze interrogations of wider aesthetic and social issues through several disciplines, creating new forms and communities. This exhibition organizes the encounter between The House of Dustand the Schindler House, two very singular architectures that coincide in numerous dimensions. They both represent alternatives to functionalist architecture and conventional behavior. 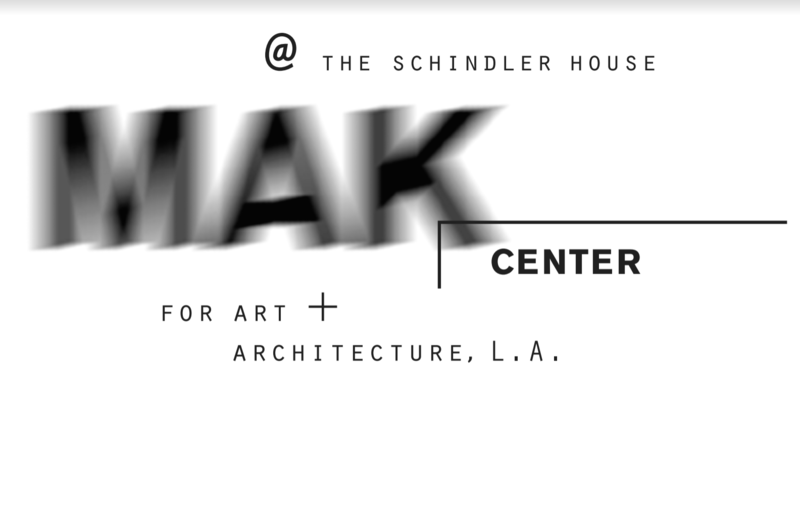 Visit www.makcenter.org for a complete schedule of programs and performances. Art by Translation is a research and exhibition program initiated by École Nationale Supérieure d’Arts de Paris-Cergy and École Supérieure d'Art et de Design TALM-Angers, directed by Maud Jacquin and Sébastien Pluot, founding directors, and Jeff Guess, pedagogical director. It is supported by the French Ministry of Culture and collaborates with a host of international academic and art institutions. Organized in sessions dedicated to specific research themes, this itinerant program takes place at different sites in Europe and North America and develops artistic and curatorial projects, discursive events, and publications in collaboration with museums, art schools, and universities. As a post-graduate program, it involves 4 selected artists and curators each year. The 2018-2019 participants are Lila Athanasiadou, Jasmin Blasco, Daniel Frota, and Slow Reading Group (Bryana Fritz and Henry Andersen). The first session is dedicated to the processes and ideological stakes of translation in the arts. and the Fitzpatrick-Leland House (1936). FLAX promotes mutual understanding between the diverse communities of Southern California and France through the arts. A California-based 501(c)(3) public charity FLAX is committed to collaboration, innovation, exchange, and sustainable impact. FLAX’s program offers Southern California artists and organizational partners reciprocal and collaborative opportunities with artists, curators, and cultural institutions based in France. FLAX has a strong commitment to public engagement, introducing large scale art projects in collaboration with established cultural institutions. The California Institute of the Arts has set the pace for educating professional artists since 1970. Offering rigorous undergraduate and graduate degree programs through six schools—Art, Critical Studies, Dance, Film/Video, Music, and Theater—CalArts champions creative excellence, critical reflection, and the development of new forms and expressions. The Nomad Floor is a project of CalArts Dance conceived by Dean Dimitri Chamblas. It is a studio, gathering place, gallery, blank slate, habitat and point of discussion about context, performing and witnessing performance. This project is supported, in part, by the Los Angeles County Board of Supervisors through the Los Angeles County Arts Commission; the City of West Hollywood; and the FLAX Creative Circle including The Skylark Foundation, Arthur Forney, Olga Garay English and John Mark Horton. Additional support is provided by the Cultural Services at the French Embassy, Los Angeles Office.